This month I review a new app that enables iPhone users to view Google Analytics on the move; delight in the merger between iPerceptions and ClickTale; take a look at the Beginners Guide to Website Speed Optimisation; and assess the benefits of the Dropbox Pro upgrade. Google has released its first analytics app for iOS, bringing a welcome end to awkward screen manipulation to view site metrics on an iPhone using a browser. We’ve spent the past month playing with our favourite analytics platform on the app and comparing it to the desktop version. The home screen has a real-time overview of site users and we love the well-presented summaries of acquisition, behaviour and conversions. More details are available by clicking through, enabling you to add segments to slice and dice the data, although previously created custom reports, dashboards and segments are not accessible via the app. 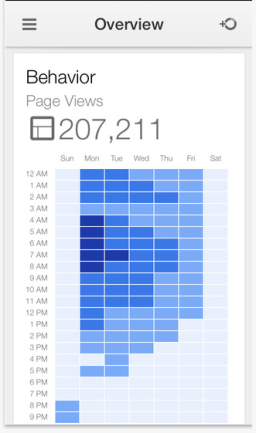 Although a little slow to load and update compared to the desktop version, the app has a couple of unique features, such as a heat map of pageviews that enables you to instantly identify the most popular time for site visits. The app is free to download here https://itunes.apple.com/gb/app/google-analytics/id881599038?mt=8 and follows the launch of the Android version in June. iPerceptions is a great voice of customer survey tool and ClickTale is a digital customer experience tool that records website visitor sessions. The two companies have joined forces, creating an integrated version of the two solutions. iPerceptions is not one of our core Conversion Rate Optimisation tools, but there are projects where we use it to carry out customer research. Although it provides extremely useful data, it can raise as many questions as it does answers. For example, we can establish that a visitor wasn’t able to complete the task they arrived to do, but not necessarily know why. Integrating the two solutions means that a ClickTale session playback is automatically triggered when gathering iPerceptions voice of customer research which will provide a visual context to the data. I’m excited about the merger and although I didn’t see this one coming, I’m sure it won’t be long before we wonder how we lived without the additional insight. A Beginners Guide to Website Speed Optimisation is full of tips for removing a key roadblock to the performance of any website: slow loading pages. The guide dedicates six chapters to research demonstrating how optimising your site’s speed can increase customer satisfaction and boost sales as well as easy to follow instructions to streamline and reduce the size of your data to speed up performance. Website Speed Optimisation is one of a wide range of solutions that can be used to increase conversion rates. However, it is not easy to measure results as split testing can’t be applied – a technique we offer for other Conversion Rate Optimisation improvements. The guides does contain some WordPress spin, but the core principles, techniques and recommended improvements apply to all sites. and is definitely worth a look if you think that slow loading pages are slowing down your conversion rates. Although not a Conversion Rate Optimisation tool, Dropbox Pro is a useful tool for sharing documents and is key to how we work collectively at AWA digital. It is a great tool for sharing data between remote teams like ours and is now bigger and more secure. The recent update has increased the storage space available to 1,000 GB as well as added some new sharing controls. These include passwords for shared links, view-only permission available for shared folders and expiry dates for shared links. In addition, a remote wipe feature lets you delete Dropbox files from a lost or stolen device. The new features will automatically be added to existing accounts and bring added peace of mind when sharing files remotely.